Universal health coverage in China - are we there yet? An interesting reference article in The Lancet today comparing the progress to universal health coverage in the BRICS countries (Brazil, Russia, India, China, South Africa ...). The section on China I presume is written by Professor Wang Kongde of the School of Public Health at Peking University. Some of the useful facts in the article, such as China's health expenditure increasing from ¥75 billion in 1990, to ¥1998 billion in 2010. At the same time, average per-head health expenditure increased from ¥65 to ¥1490. 2. The Urban Employee Basic Health Insurance (UEBHI) - covers 30% of population, jointly funded by employers and employees. 3. The Urban Resident Basic Health Insurance (URBHI) - cover urban residents not enrolled in UEBHI. 4. 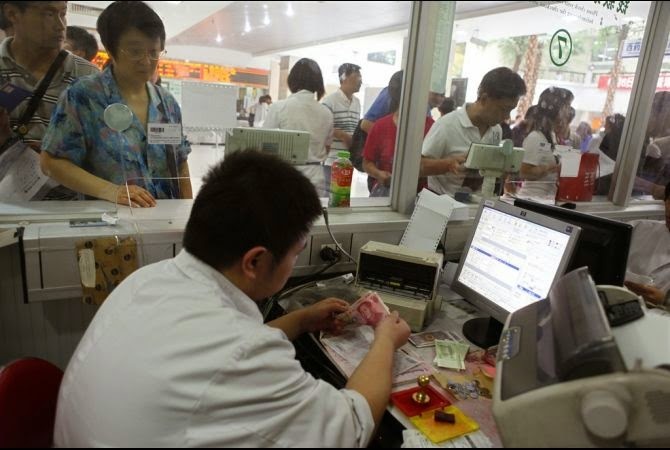 The Medical Financial Assistance system (MFA) - a relief scheme for China's poorest citizens, (70 million people), providing direct aid for the severely disabled and people with serious illness. According to the Lancet article, the rural and urban health scheme provide 75% reimbursement for inpatient expenses (but I have heard that it actually cover much less than this and patients face high out of pocket expenses even with insurance). These three systems, NRCMS, URBHI, and MFA, complement each other and greatly expanded the range of health service benefits. Professor Wang say the Chinese government aims to expand the insurance schemes to reduce health spending to less than 30%. For example, subsidies to rural residents will increase to ¥360 by 2015. "Meanwhile, efforts will be made to standardise and improve reimbursement plans, enhance inpatient reimbursement, and undertake broad outpatient pooling fund reimbursement continuously to increase the number of people benefiting from the NRCMS," he writes. However, he acknowledges that China's publicly-subsidised health insurance schemes face many problems in achieving universal coverage. Like other countries, China faces an ageing population and increasing rates of chronic diseases, not to mention higher expectancy for health services. He notes that access to health services and resources varies widely between regions. Cost control is also a major problem. Simply increasing government funding may just trigger overservicing with the use of more inappropriate tests and expensive medicines. Thus measures on cost control are urgently needed, and also a stronger regulatory system and reform of hospital governance. Professor Wang also notes that China is going through a turbulent period of health reform, and that many in the health ministry and government are inexperienced in this area. Therefore, the road to universal health cover for China remains uncertain.